These were the 17th (2014) and 18th (2015) years that Pleasant Valley Conservancy has been burned. For a summary of all burn years, see this link. In addition to the spring burns, a major fall burn of the complete North Woods was done on October 29, 2014. See this link for details. The best burn weather is in the 11 AM until 3 PM period and the crew is made to understand that time cannot be wasted during this period of the day on lunch or other “social” activities. Crew members should carry whatever lunch items they need on their person (power bars are distributed before the burn begins). The water supply vehicle carries lots of extra drinking water, and the crew is urged to avoid dehydration. Spring burns: In general, spring burns are relatively easy to carry out. The burn season is fairly long, and the fuel is well cured. The key is to start as early in the season as possible. The quite different starting date between 2014 and 2015 was because of weather variables. Some issues that may arise: 1) getting DNR approval for a burn; 2) statewide burn bans; 3) lining up crew; 4) variable weather. In 2015 we employed an experienced fire weather meteorologist to provide advanced warning of when good burn weather could be anticipated. Fall burns: These burns are often difficult. The burn season is fairly short and the prairie fuel will not be well cured. However, fall is generally the best time for oak woods burns. A successful oak woods burn depends on leaf fall, which is somewhat variable from year to year. (In 2014 we had great leaf fall of all oak species the last three or four days of October.) DNR approval is not needed in the fall and statewide burn bans never occur. Since few fall burns are done in our area, a crew is easier to get. However, good burn weather may never develop. Daylength is shorter. Night burns should be avoided except in unusual situations. Even in the spring, with DST and longer days, conditions at night are generally unfavorable (higher RH; unsure footing; difficult mop-up). In the fall, night burns can almost never be done. Prescribed burning is a seven-day-a-week job. This does not mean that burn crews must work seven days a week, but some crew members must be prepared to work on Saturday and/or Sunday instead of one or two weekdays, if necessary. Readers of this blog may be aware of the problems we have with invasive sunflowers, members of the genus Helianthus. Our biggest problems are the various woodland sunflower species, especially H. divaricatus, and H. decapetalus. In addition, sawtooth sunflower (H. grosseserratus) overflows some wetland areas, and Jersusalem artichoke (H. tubersosus) is lurking here and there. Even showy sunflower (H. pauciflorus) is a potential invader. That is why I was delighted to discover a nice small patch of western sunflower, H. occidentalis, in the Pocket Prairie. 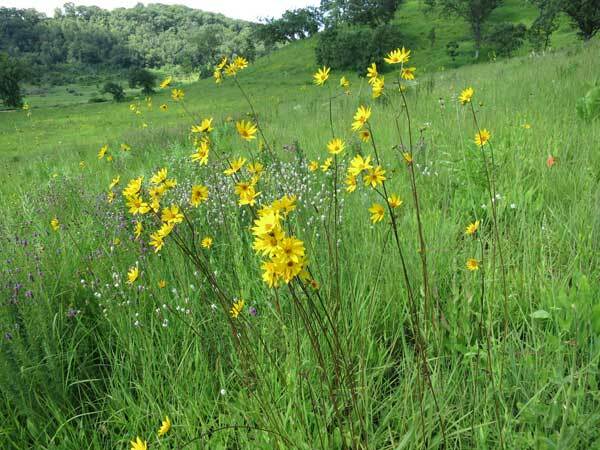 According to the Illinois wildflower website, this species "is usually found in higher quality habitats..." and the Prairie Moon website says: "Western Sunflower is well-behaved, compared to some of the more aggressive Helianthus species." Of course, our population came from seed, planted I don't know how many years ago. Because of its delicate nature, it may be hard to find in a lush planted prairie. I was concentrating on populations of white and purple prairie clover when I found nearby the patch shown on the photo. As the photo shows, the flower stalks of this species are virtually bare, all of the leaves being in basal rosettes. It has a Coefficient of Conservatism of 6. We were favored again at Pleasant Valley Conservancy in 2015 with the expert bird surveys by Roma Lenehan. She did her first bird survey at PVC in 2008 and has returned frequently. This year she led the first survey with the University League Bird Group on May 29, 2015, and another on June 9 with Susan Slapnick. "In 2015 several species were found that had not been observed in the prior years: Wood Duck (female heard), Rock Pigeon (flyover), Chimney Swift (flyover), Redstart (1 heard), and House Finch. Eastern Meadowlark and Wood Thrush were especially obvious this year. In addition, rare savanna specialists Orchard Oriole and Red-headed Woodpecker remain in good numbers. Indigo Buntings (21) and Baltimore Orioles (14) also appear in good numbers. In contrast, Kestrel, Pileated Woodpecker, and Sedge Wren (low numbers regionally) were not found on either visit." A complete summary of the birds seen can be found on the PVC web site at this link. Pleasant Valley Conservancy offers outstanding habitat for a variety of cavity-nesting birds. Some of the best areas to see red-headed woodpeckers and orchard orioles are along the service road that traverses the ridge-top savanna, where bur, red, and Hill's oaks are especially prominent. In addition, Kathie maintains an extensive bluebird nesting box trail. Wild quinine (Parthenium integrifolium; sometimes called "American feverfew") is having a banner year at Pleasant Valley Conservancy. 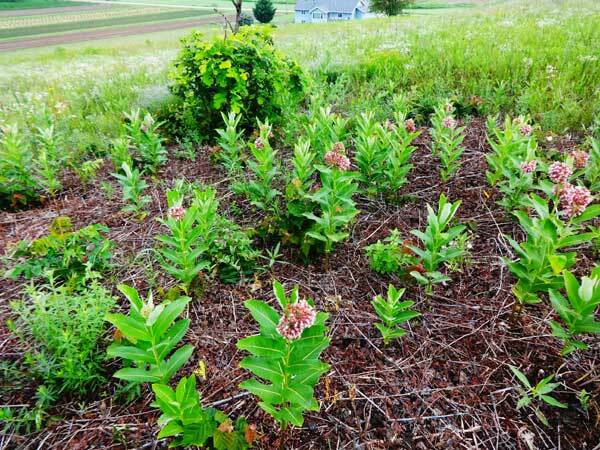 This plant, listed by the USDA as Endangered in Minnesota and Maryland, Threatened in Wisconsin, and Extirpated in Pennsylvania, is surprisingly easy to grow. Presumably it has become rare because its principal habitat, rich mesic prairie, is now dominated by agricultural row crops. At Pleasant Valley Conservancy it has been in the seed mix for some of our planted prairies, as well as in open savannas. Typical of most plantings, the success varied with the year of planting and the details of the seed mix. 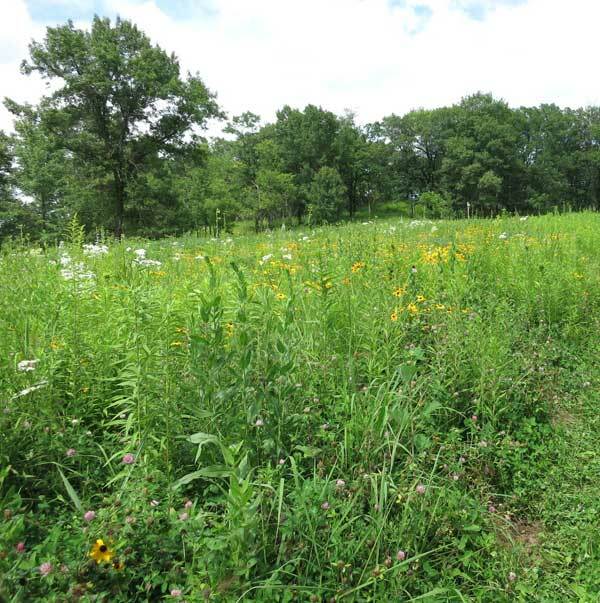 Our best success has been in the Ridge Prairie, a 1.5 acre site at the far east end of the Conservancy. 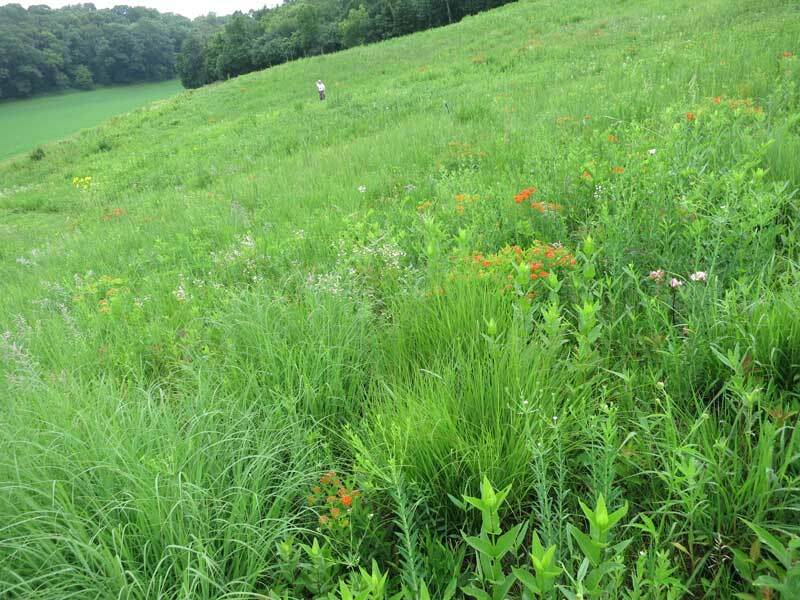 It is interesting that this prairie is on sandy soil at the top of a ridge, where mesic conditions would not be expected. 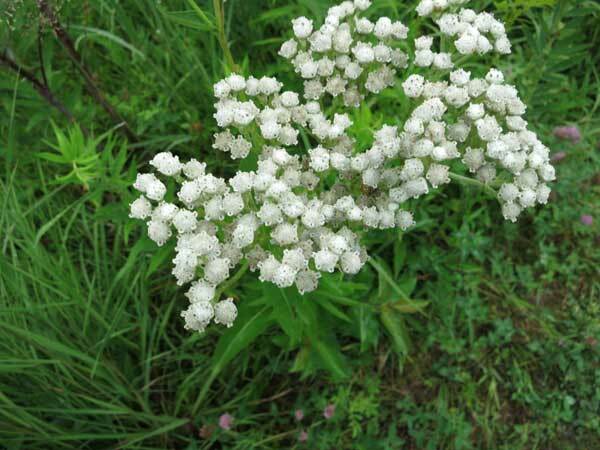 Despite this, wild quinine has been present extensively since the early years of planting. This year it is especially prolific, presumably because of the good consistent precipitation we have been having. 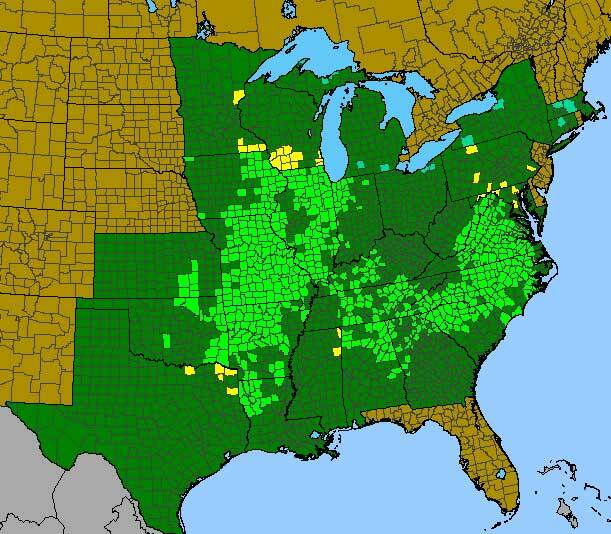 Map of the distribution of wild quinine in the U.S. Courtesy of the Biota of North America Program, Chapel Hill, N.C. Despite the common name, this species does not contain quinine. Rather, the leaves have a bitter taste resembling that drug. It is fortunate that wild quinine is easy to grow in gardens, as herbalists make extensive use of it. However, it is not listed in the U.S. Pharmacopeia. There is a lot of invasive brush removed in our area by volunteers. For scattered shrubs, hand loppers often work best, often as a two-person job, one on the loppers, the other on the spray bottle (containing 20% Garlon 4 in bark oil). But many woody species are clonal and form dense patches. For this sort of work, nothing beats a Stihl brush cutter fitted with a saw-tooth blade. A single person operating the Stihl can remove a dense clone very quickly, with the rest of the volunteers operating the spray bottles. 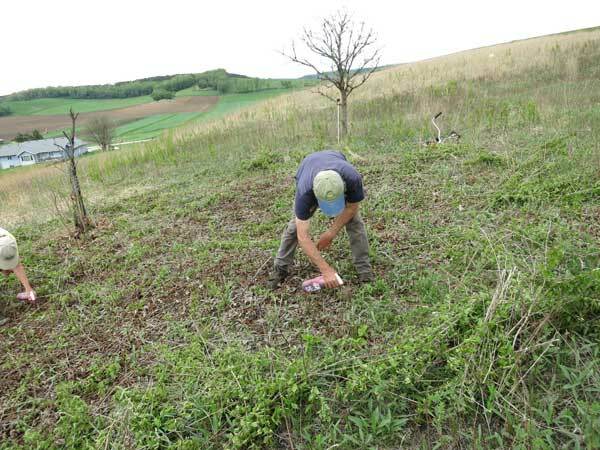 In May we used this approach for a large, dense hazel clone at Black Earth Rettenmund Prairie. As the first photo shows, the clone was about 12 feet in diameter, and the stems were very close together. During the 15 minutes that Willis was cutting the clone, the volunteers were removing the cut stems to a nearby brush pile. As soon as the area was clear, they started treating the cut stems. Lots of stoop labor here, but the whole job took three people about 45 minutes. Because a sharp saw blade was used, the cut stems were very clean and even, making treatment very easy. The second photo shows this same site two months later. 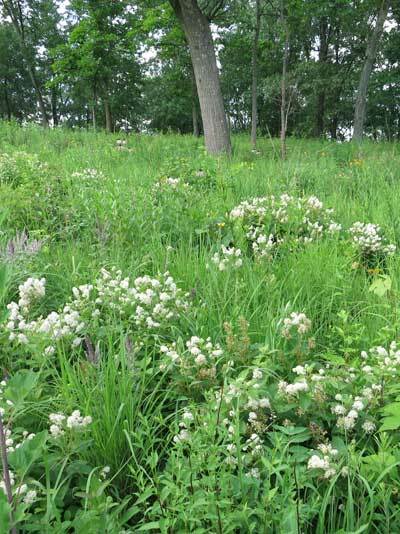 It is already filling in with native vegetation, mostly milkweed. Woodland sunflower (Helianthus divaricatus) is definitely an invasive species and can take over prairies, savannas, pastures, and even backyards. I get questions about how to control it. The only way I have found to control it is with herbicide. For large patches, spray with glyphosate, since this herbicide does not leave any residual activity in soil. Then burn the thatch and replant the bare area. For small areas, use the Garlon 4 spritz technique, which is described in this link. Time-consuming but effective. However, you must return next year and catch any new plants that may pop up from underground roots. 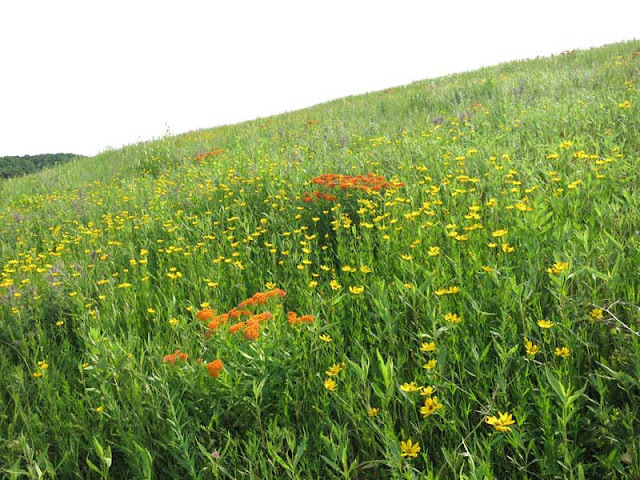 This summer promises to be a fine one at Black Earth Rettenmund Prairie. The great spring burns and the consistent June rainfall have combined to bring along outstanding floral displays. Although color should not be the main attraction of a fine prairie remnant, it certainly adds to the joy of a visit. Note the complete absence of woody vegetation (compare with the photo below taken in the 1970s). Kathie and I will be leading an evening field trip on Wednesday July 8, 2015 from 6:30-8:30 PM. Come join us! An unusual display of Coreopsis palmata mixed in with Asclepias tubersosa and Amorpha canescens. The South Unit in its full glory. on the Saddle area. Later this area would become even more heavily wooded. Prairie Enthusiasts to turn this prairie into what you see today. New Jersey tea (Ceanothus americanus) is now in full bloom and we have a lot of nice examples on our ridge-top savanna (Unit 11A). This Unit is especially interesting because parts of it were original prairie remnant. (It was completely open at the time the 1937 aerial photo was taken.) Although it was fenced for grazing, it was sufficiently far from the barn so that cattle probably rarely reached it. I first discovered this area soon after it had been cleared of invasive brush and found three small New Jersey tea bushes and a few lead plant (Amorpha canescens). (Although not as showy, several lead plants can be seen in the photo to the left.) 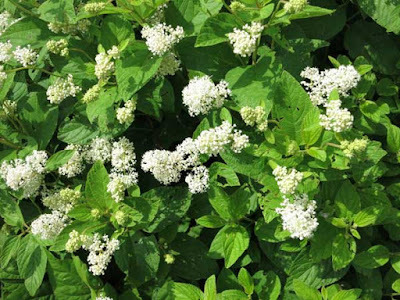 Since then, with annual burns and continued weeding, both the Ceanothus and the Amorpha have spread. Although we have planted both species nearby, the area shown in the photo has been allowed to grow on its own. New Jersey tea is primarily a savanna species, but it is also found in prairies, such as the area shown here. It is especially gratifying that we have so much of it at Pleasant Valley Conservancy, since it has a Coefficient of Conservatism of 9! New Jersey tea is in the same family with buckthorn (Rhamnaceae). It is indeed shrub-like, but because we burn our savannas annually, it must start over each year. In California chaparrals other species of Ceanothus form large bushes. The seeds of New Jersey tea are small and hard and are difficult to germinate. Before we plant them we throw the seeds into boiling water for about 30 seconds, then quickly douse them with cold water. This treatment, together with fall planting that gives them cold moist treatment, seems to work, and we now have quite a few well established plants. The easiest place to see New Jersey tea at Pleasant Valley Conservancy is along the trail that we have mowed across the middle of Unit 11A. This trail starts where the Side Road and Saddle join (near the Rocky Overlook), and is well worth a stroll, as it takes you through a fine open savanna. (The last part of the trail goes through a closed savanna and ends up at Toby's Prairie.) In addition to the great plant life, this trail is an excellent place to see red-headed woodpeckers and butterflies.